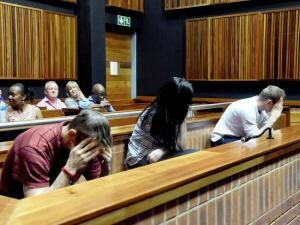 Johannesburg – A Boksburg woman, her fiancé and former fiancé have all been found guilty of robbing a Vosloorus saleswoman of her jewellery, murdering her and burning her body. The three distanced themselves from last year’s murder of 23-year-old Nthabiseng Selesho and instead implicated each other in her death. In other instances, they feigned ignorance with regard to Selesho’s murder on September 4 last year, either not having seen her being killed or not being aware there were plans to kill her. However, Acting Judge Andre Petersen found that Candice Prevost, Ashley de Villiers and Wayne Williams had planned to rob and kill Selesho. Judge Petersen also likened the testimonies of the trio to the three Japanese mystic monkeys which embody the principles of see no evil, hear no evil and speak no evil. “In Western culture, the phrase is often used to refer to persons who deal with impropriety by turning a blind eye,” he said. The judge said the assertion that the three were so under the influence of drugs that they could not be held responsible for their actions did not apply in this instance. He said it was surprising they could claim they were not totally lucid on the day of the murder and robbery, yet a year later, they were able to recall exactly what happened, the time, the duration and the sequence in which it did. “The three acted in common purpose to rob and kill the deceased,” he said. There was relief in Court 12 at the high court sitting in Palm Ridge when the judge pronounced the three guilty. Many people in the gallery were wearing T-shirts with Selesho’s face on them. Among them was her boyfriend, Ketso Monaheng, who has a year-old son with Selesho. Monaheng said although he was happy with the verdict, there was a point in the trial when he thought the trio would be acquitted. “That was when the case was being postponed over and over again, and at that point, I thought they would be acquitted. At least this Christmas won’t be the same as last year’s. “The fact that they have been convicted and we also have a clear picture of what happened that day will make this Christmas better,” Monaheng said. Selesho’s uncle, Sledge, said it had been a long journey characterised by the many postponements. Like Monaheng, he said the family were relieved now as they knew what had happened to her. “Hopefully they will spend a long time in prison. The sentencing of the trio is to be handed down on January 20.